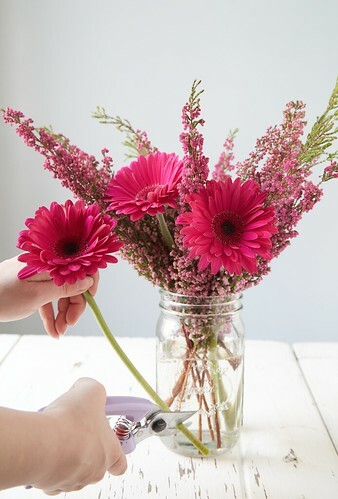 A pretty flower arrangement can brighten a room, dress-up a dinner party, and of course, make your mom smile. We asked our flower expert, Saralyn Revello, for her go-to spring flower combinationsand expert advice on floral arrangements for Mother’s Day. Why They Work: One word, monochromatic! Flowers within the same color family with different textures really work well together. Monochromatics brighten up a room without looking mismatched…. 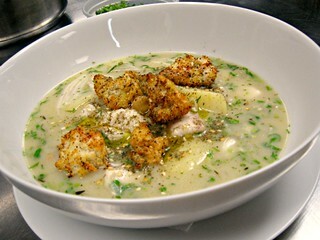 I love to make fish soups and like with most things I cook, I try to let the ingredients dictate what I will be cooking. Recently, our fish department had some gorgeous red snapper so I went for it. I decided to combine my love for spice and Lebanese and Arabic cuisine to make up a fish soup. Though this cuisine usually uses yogurt, I decide to use crème fraiche since yogurt is tricky and can easily curdle. Crème fraiche provides the tang and acid of the yogurt, with none of the complexity of dealing with the delicate cooking. The beautiful thing about soup in general is that it is all about love- truly you can judge a good cook by their ability to make a soup (and a salad but that’s a different post!). Take the same care with soup as you would with anything you are cooking (ingredients, seasoning, doneness, viscosity, depth, etc.). Soups are generally NOT a quick thing to cook (be suspicious of soup recipes that equate quick with good), but the payout is generous, and usually worth at least two meals, depending on how many people you are feeding. This recipe should feed about 6-8…. 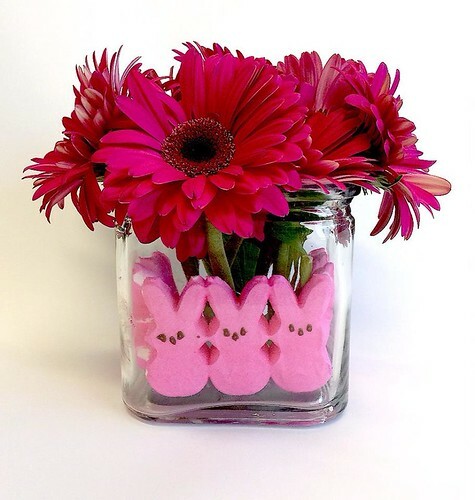 Are you getting together with family and friends for Easter or Passover? If so, we’ve put together some fun recipes to enjoy before or after your Easter egg hunt (decorated deviled eggs) or at the Seder table (tuna boats). For Easter, how about decorating eggs—on the inside? 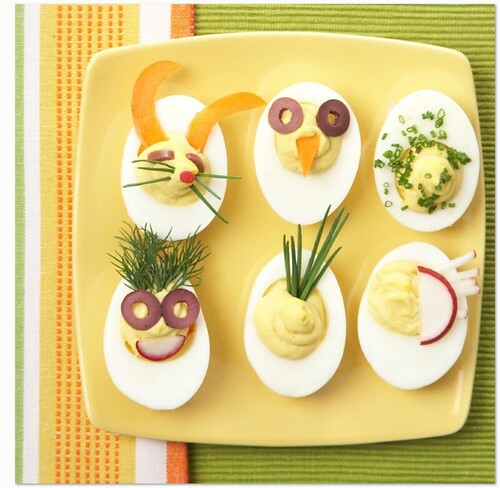 With our “Mild Mannered Deviled Eggs” recipe below, you and the kids can have fun making bunnies, funny faces, and more. If you don’t mind colored egg whites, you can even use up your excess Easter eggs. When you’re a cheese wiz — like our cheese and specialty foods buyer, Ken Blanchette — late spring and early summer mean a delicious seasonal flavor shift for many fresh cheeses. But you don’t have to be an expert to get excited about fresh spring cheeses! Read on to learn about Ken’s early-summer cheese favorites (both local treats and imports), score two affordable wines for perfect spring-cheese pairings and learn a little more about why eating seasonal cheese is so exciting…. I’ve never met a vegetable I didn’t like, and that was true even before I was more or less professionally bound to say such things by virtue of being a card-carrying Commission on Dietetics registered dietitian (RD). And it’s an exciting time to love veggies, because the spring season’s bounty is here. Delicate, first of the season, limited-availability vegetables have finally arrived, just as my palate is ready to come out of hibernation, too. While there are a number of exciting spring vegetables to explore, three of my favorites that have me daydreaming about getting into the kitchen are wild fiddlehead ferns, baby purple artichokes and wild ramps…. 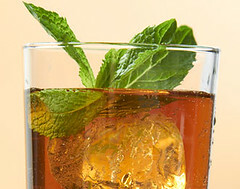 Delicious Drinks for Derby Day! Derby Day is a time for big bets, bigger hats and tasty cocktails. Fashion is high and the expectation of a derby-themed cocktail is higher. Cocktails for the Kentucky Derby! Here is a duo that should cover your bases for a party scenario that often encompasses an array of taste preferences. I can still remember my first taste of raw fennel. I had yet to reach the age of happily consuming vegetables (and broccoli only served to amuse me with its tree-like appearance), but here was a crunchy vegetable that looked a little like celery and… TASTED A LOT LIKE CANDY! One crisp, licorice-scented bite and I was hooked. Once I started cooking on regular basis, my childhood appreciation of fennel’s sweet flavor developed into a deep, abiding love. It might seem silly to declare my devotion to foeniculum vulgare, but I find fennel to be such an engaging ingredient. This singular vegetable develops a variety of characteristics based on different preparations, and it brings its distinct flavor to whatever I’m preparing. April fools? No trickery here! The fruit fool is an old English dessert that was traditionally made with layered gooseberries and custard — very much like a trifle without the sponge cake layers. 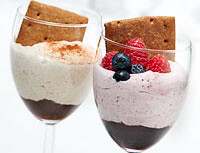 Both delicious and easy to make, the fool is a light, fruity dessert that’s ideal for serving after a spring dinner…. After a long, cold winter this year, we’re more than ready to welcome spring into the kitchen. Truthfully, the very best spring vegetables aren’t yet available (though they’re coming soon! ), but we’re so excited about the change of season, we’ve selected a few great recipes that use available fresh produce and a few quick-frozen veggies to help bridge the gap between the slushy days now and sunny days that are yet to come. Try these easy, breezy meals from our One-Click Recipes area to enjoy a luscious taste of spring — even before the temperature rises….